To ride the trails in Wisconsin you will need to purchase a Wisconsin trail pass. Trail passes for the 2016/17 season are on sale now. Please note: Trail passes will be mailed out in the fall. For Wisconsin Snowmobile Club members passes will cost only $10/year. Trail passes for non-club members will be $30/year. You will need to have a current AWSC (Association of Wisconsin Snowmobile Clubs) membership number to qualify for this discount. AWSC membership is included with your local club membership. Snowmobiles must be registered in name of the member, their spouse and children under the age of 19. Children 19 and older will need to join a club to qualify for the trail pass discount. If you are not a snowmobile club member or your membership has lapsed, you will need to join or renew you snowmobile club membership as soon as possible. Once you receive your AWSC membership card/number you can purchase your trail pass from AWSC.ORG. 1. Join the Moon Shiners Snowmobile Club or any other snowmobile club in Wisconsin. You can find a complete list of clubs by visiting the AWSC Web site..
2. Your membership application is processed and you will receive your membership card and number. 3. 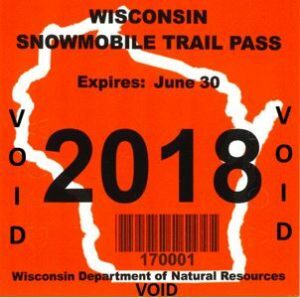 Use your membership number to purchase your trail pass online or via mail your Trail Pass order form to the Association of Wisconsin Snowmobile Clubs (AWSC). Download a PDF copy of the Trail Pass order form here. Do not wait until the snow starts to fall to get your trail pass. It will take a little time to process new membership applications so please, plan ahead early to avoid delays. AWSC is the Association of Wisconsin Snowmobile Clubs. AWSC membership is included with your Moon Shiners membership.